The half-free morels, Morchella punctipes and Morchella populiphila, have caps that are attached about halfway down the stem, creating a substantial overhang where the margin of the cap hangs around the stem. 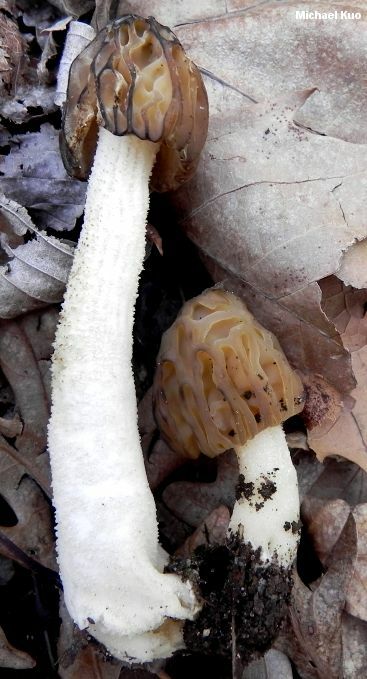 Though the two species cannot be separated on the basis of their physical features, they are separated by geography; Morchella punctipes appears in hardwood forests from the Great Plains eastward, while Morchella populiphila appears under black cottonwoods in northwestern North America. Both species used to be called "Morchella semilibera"--before a recent DNA study (O'Donnell and collaborators, 2011) found support for the idea that Morchella semilibera is a strictly European species, and that our North American species are genetically distinct. Many of my morel-hunting comrades in the Midwest, God love 'em, call the half-free morels "peckerheads." The name "punctipes" was applied by a North American mycologist, Charles Peck (1903) to a Michigan half-free morel that was sent to him (he was based in New York state) and which featured what he called a "squamulose stem," for which "[t]he adornment . . . consists of small conical points which are sometimes darker colored than the stem and are then more conspicuous." Thus, Peck coined the epithet punct - ipes (spotted - stem) and named a new species because, in his estimation, the usual half-free morel (Morchella semilibera) had a smooth stem. Peck's ideas are supported by the Friesian description of Morchella semilibera (1822), which says: "stipite laevi" (stem smooth). I have not collected the European Morchella semilibera, so I am not speaking from personal experience . . . but O'Donnell and collaborators (2011) found support for only one half-free morel in Europe, and photos of what must therefore be this mushroom on the Internet and in European field guides easily demonstrate that the stem of the European half-free morel, like the stems of its North American counterparts, is often adorned with the "small conical points" mentioned by Peck, but is sometimes more smooth and is occasionally nearly bald. In other words, the presence or absence of the spots on the stem appears to be a highly variable character, and Peck's idea is not supported. However, Peck named a morel and, regardless of whether his concept held water his name still applies according to the rules of taxonomy. 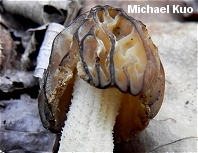 Thus Kuo and collaborators (2012) applied Peck's epithet to the eastern North American half-free morel rather than name a new species (we were also able to validate a better known Peck morel species, Morchella angusticeps). Ecology: Possibly saprobic and mycorrhizal at different points in its life cycle; growing alone, scattered, or gregariously under hardwoods in various forest types; common in some years and rare or absent in others; March to May; widely distributed east of the Rocky Mountains. Cap: 2-4.5 cm tall and 2-4.5 cm wide; conical or broadly conical (rarely nearly convex); pitted and ridged, with the pits primarily arranged vertically; when young with bald, flattened, yellowish brown to pale brownish ridges, and whitish to pale yellowish pits; when mature developing flattened to sharpened, dark brown to black ridges and yellowish brown to brownish pits; attached in a skirt-like manner to the stem, about halfway from the top; hollow. Stem: 1.5-15 cm high and 1-4.5 cm wide; often hidden under the cap when young, but lengthening dramatically with maturity; fragile; in warm, wet conditions becoming inflated, especially toward the base; sometimes developing longitudinal furrows; white to watery brownish; usually mealy with whitish granules that sometimes darken to brown, but sometimes nearly bald; hollow. Spore Print: Yellowish orange to whitish. Microscopic Features: Spores 20-27 x (10-)14-18 µ; smooth; elliptical; without oil droplets; with homogeneous contents. Asci 8-spored. 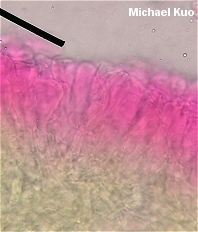 Paraphyses cylindric with rounded, subclavate, clavate, mucronate, or irregularly inflated apices; septate; hyaline in KOH. Elements on sterile ridges 50-100 x 10-25 µ; septate; tightly packed in an even layer; brownish in KOH; terminal cell broadly clavate to subrectangular with a flattened to broadly rounded or submucronate apex. SPECIMENS EXAMINED: Herb. F. 04229501, 05299601, 04179801, 04170303, 04180301, 04190301, 04200302, 04240304, 04270301 04270305, 04290303, 05020302, 05030301, 05030303, 05130308, 05150301, 05210302, 04080406, 04110404, 04150403, 04200404, 04200405, 04230403, 04270402, 04270403, 04280408, 05010401, 05010409, 05080405, 05080406, 05110406, 05110408, 05020502 (epitype), 04120601, 04260601, 05040601, 05270602, 03311101. Morchella punctipes Peck, 1903: Bulletin of the Torrey Botanical Club 30: 99-100. Original description (Peck 1903): "Ascomate conical, subacute, free to the middle, longitudinally ribbed, the costae sparingly branched toward the margin, connected by transverse veins, pallid with the edges blackish in the dried specimens; stem hollow, swollen toward the base, minutely squamulose or furfuraceous, whitish; asci cylindric, 8-spored; ascospores elliptic, even, 20-30 µ long, 14-18 µ broad. Ascomate 1.5-2.5 cm. long; stem 7-10 cm. long, 1-2 cm. thick. Agricultural College, Michigan. June, B. O. Longyear. This species is closely allied to M. gigas, M. rimosipes and M. semilibera. 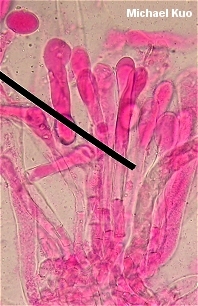 From the first two it may be separated by the pileus being free from the stem, at least to the middle, and from the last by its larger ascospores and squamulose stem. The adornment of the stem consists of small conical points which are sometimes darker colored than the stem and are then more conspicuous. In larger specimens there are one to four perforations at the base, but no chinks as in M. rimosipes. The inner surface of the stem is glabrous." The holotype of Morchella punctipes is held in the Mycological Collections Herbarium of the New York State Museum (NYS). A small portion was made available to O'Donnell et al. (2011) for molecular study, but after the specimens were returned the herbarium lost funding and staff. A moratorium was placed on loans, and the holotype could not be fully studied for morphological data. Through the kind efforts of Dr. John Haines we were able to provide the microscopic data presented here, as well as provide a preliminary assessment of the collection. The collection consists of several well preserved ascomata in a single box, with an annotation label that reads "Probably the type of Morchella punctipes Pk." initialed by J.H.H. (Dr. John Haines) in 1984. Data from study of the holotype. Dried ascomata 55-85 mm high. Hymenophore 14-18 mm high x 11-16 mm wide, with 14-16 primary vertical ridges and occasional shorter, secondary vertical ridges, with occasional or frequent sunken, transecting horizontal ridges. Ridges nearly glabrous; flattened or sharpened. Stipe 35-65 x 11-16 µ; punctate with brownish granules. Ascospores 27-31 x 14-18 µ; elliptical; smooth; contents homogeneous. Asci 170-270 x 19.5-20 µ; cylindric; hyaline in KOH (2%). Paraphyses not measured. Elements on sterile ridges 85-89 x 19.5-20 µ; clavate. DNA useful for PCR could not be extracted from the holotype following the methods of O'Donnell et al. (2011). Discussion. We studied the putative holotype of Morchella punctipes with hopes of applying Peck's name to one of two semilibera-like morels found in North America. Results from O'Donnell et al. 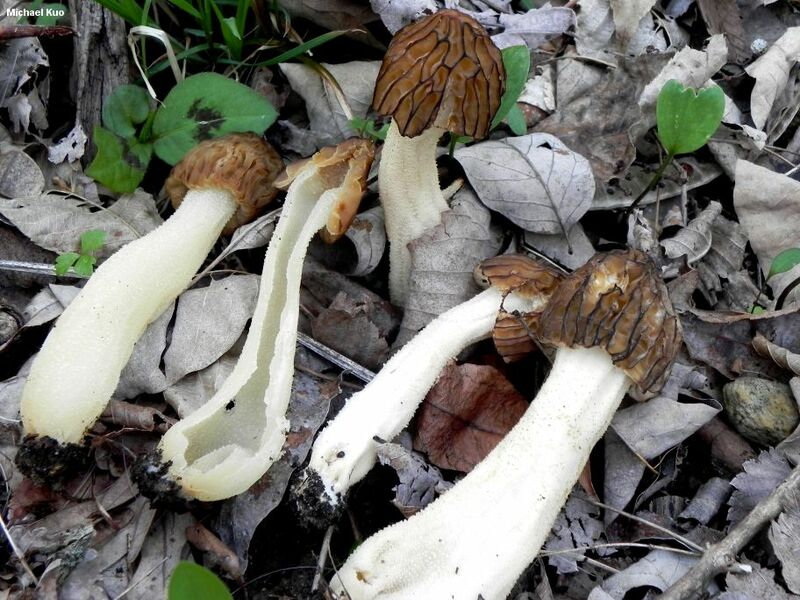 (2011) supported two phylogenetic species matching the morphology of Morchella semilibera, one of which (Morchella populiphila) occurs under black cottonwoods in western North America, and the other of which occurs under various hardwoods from the Great Plains eastward. Although we were unable to generate informative DNA sequences from the type collection of Morchella punctipes, Peck's description and the morphology of the type specimens match the morphology of the eastern North American semilibera-like specimens we examined, which correspond to phylogenetic species Mel-4 in O'Donnell et al. (2011). One of the specimens we examined (05130308) was collected in the county adjacent to the type locality ("Agricultural College, Michigan" refers to what is now known as Michigan State University, in Ingham County; 05130308 was collected in neighboring Clinton County). Since we studied many semilibera-like specimens from across North America and found only the two phylogenetic species, we are confident that Peck's name can be accurately applied to the eastern species. Kuo, M. (2012, October). Morchella punctipes. Retrieved from the MushroomExpert.Com Web site: http://www.mushroomexpert.com/morchella_punctipes.html.